What do we want? High engagement! And when do we want it? Now! – The words each and every social media manager chants into their client’s Instagram pages on a daily basis. Visual, interactive and oh-so addictive – just a few ways to describe this stupendously successful social media platform. With over 1 billion monthly users and 200 million ‘grammers visiting the profiles of businesses each and every day, it’s no surprise that brands flock to this mega platform and look to benefit from its gold dust. Being the UK’s first public relations company to specialise in online and social media, we like to think we know a thing or two about social platforms, in particular, the focus of this blog, Instagram. Prepare yourself for further bragging…here at Wolfstar we have a range of wonderful clients in a host of different industries. From tableware and outdoor power tools to I.T. and karting clutches, we’ve helped grow their channels with quality followers and above industry levels of engagement. But what is the one kind of channel I, a social media Senior Account Exec is yet to tackle? That’s right – me, myself and I. While I spend hours upon hours perfecting my client’s captions, meticulously looking for the best and most successful hashtags, and mining for that perfect filter, my own Instagram sits there, looking lonely, mistreated and selfishly abandoned. I once saw a tweet from an influencer that resonated greatly. They stated that everyone working in social media should have a great platform themselves, as why should a client trust they can grow a great channel if they haven’t got one themselves? Fair point. So, what exactly have I brought you to this blog for? Let me get to the point. After spending my life’s fortune on a fancy new camera and feeling as though I need to make it worthwhile, I’m going on a personal Instagram journey, and you’re coming with me for the ride. This isn’t for my own personal gain. Along this journey I will be sharing with you my learnings, tips and great knowledge. How does growing a personal account differ from a brand account? Will I have to post more or less often? Perhaps I need to be even more creative without the backing of a loyal company fanbase? This is a challenge, and one I am facing for the greater good of the people. 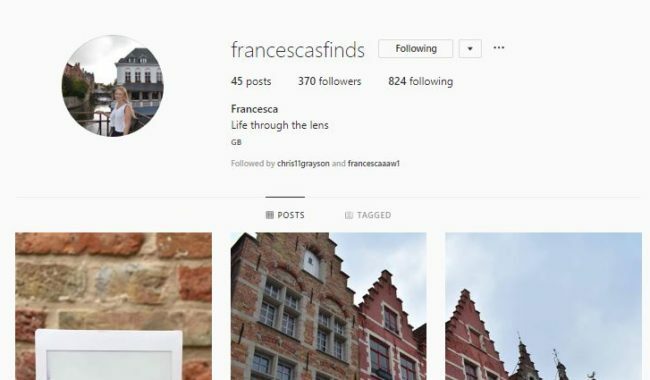 Now to the part we’ve all been waiting for, the account in question – @francescasfinds, go on, hit the follow button…please ? !